1752-1831. He was born in London, the eldest of seven children of Charles Smith and his wife Hannah, and a cousin of Captain James Cook’s wife, Elizabeth Batts. 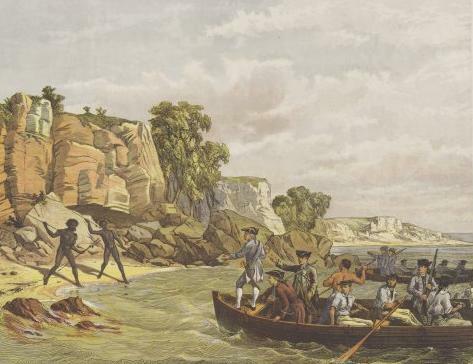 Isaac Smith prepares to step past Captain Cook prior to going ashore at Botany Bay. Smith first went to sea in the mid-1760’s, serving as a draftsman under James Cook whilst that officer surveyed the coasts of Newfoundland and Labrador aboard the schooner Grenville. He was later employed under Cook as a seaman, midshipman and master’s mate aboard the Endeavour in their Pacific and South Sea voyage of exploration from August 1768- until June 1771, and as a master’s mate aboard the Resolution in her similar voyage from July 1772 until July 1775. The respect and affection in which Cook held him can be illustrated by the fact that upon sailing into Botany Bay on 28 April 1770 it was Smith who was given the honour of first stepping ashore. He was commissioned lieutenant on 19 August 1775 and was employed for the next two years aboard the Weazle 16, Commander Samuel Warren, being further promoted commander on 13 May 1781, and posted captain on 1 December 1787. In the autumn of 1788 Smith recommissioned the Perseverance 36, going out to the East Indies in 1789 with the Cornwallis Expedition, and returning after the commencement of the French Revolutionary War in 1793. His frigate was then paid off in the late summer. As a result of contracting hepatitis Smith did not enjoy any further employment but he became a superannuated read-admiral on 8 October 1807. For many years he lived in retirement at Clapham with his cousin Elizabeth, Captain Cook’s widow, and in the 1820’s he inherited Merton Abbey from his brother. Smith died on 2 July 1831 and was buried in St. Mary the Virgin graveyard at Merton. He was regarded as a skilled nautical astronomer, having been schooled in the art by Captain Cook, who had devoted much care and attention to him. He was also a fine draughtsman and surveyor as well as a skilled artist, and he educated the future Admiral of the Fleet Sir Frances Austen in these skills whilst commanding the Perseverance. Cornwallis regarded Smith as ‘a most excellent man’ and the diarist William Hickey said he was ‘a very fine fellow’.